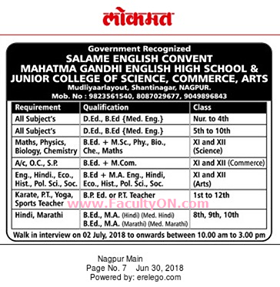 Salame English Convent Mahatma Gandhi English High School and Junior College of Science , Commerce, Arts, Nagpur has advertised in Lokmat for the recruitment of Teachers jobs vacancies. Interested and eligible job aspirants are requested to appear walk in on 2nd July 2018 . Check out further more details below. Shanti Nagar, Nagpur - 02.